As a recent College of Charleston grad, Dane Schemel’s future looked bright: he’d lined up a lucrative job with Merrill Lynch and was all set to become a broker. And then a seven-year-old named Andy messed everything up. While serving with Be A Mentor, Schemel decided to help his young mentee fabricate a wallet using a leathercraft kit and a beaver tail. The finished product proved more coveted than a kickball at recess, and the boy soon sold his creation to a friend for $1. 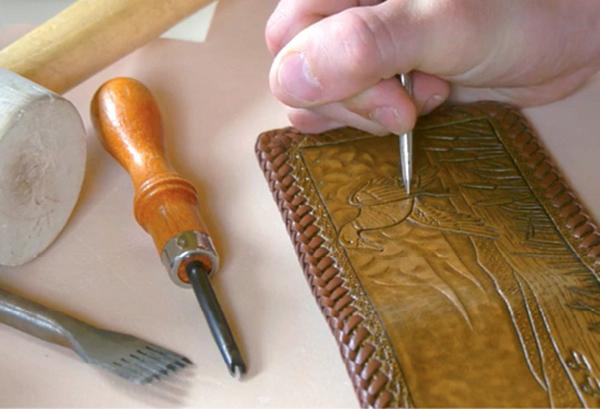 Southern Trapper’s goods, which now include rifle slings, handgun holsters, belts, and guitar straps crafted in an array of leathers—from alligator to arapaima—are all handmade at the company’s Wadmalaw Island headquarters. Folks as far away as Switzerland and Australia have ordered them at www.thesoutherntrapper.com, but locally, you can find them at M. Dumas & Sons and the Preservation Society of Charleston. ➼ Last year, Southern Trapper purchased some 3,500 sustainably sourced beaver tails from trappers across the U.S. “We made roughly 350 products from these tails and sold about 295 of them,” notes Schemel. ➼ Two noted musicians are known to use the company’s hand-tooled guitar straps: Craig Campbell and Jimmy Buffett. Campbell’s took 56 hours to complete and Buffett’s a whopping 65. ➼ At $4,000, a zebra briefcase is the priciest item in the online shop. “The zebra had been attacked by a pride of lions, and we salvaged what was left,” explains Schemel. ➼ Schemel still mentors Andy, now in fifth grade, and has set up a 529 college savings plan for him.